It’s strange being on the other side of the media. This week I took part in Radio Five Live’s breakfast show, alongside Richard Phillips from Phoenix Futures, who was also in the London studio; and clients in treatment in Phoenix’s centre in Hampshire, who were being interviewed throughout the morning by the programme’s co-presenter. I witnessed the very detailed research that went on before the programme, when the researcher contacted me to follow up different lines of enquiry and information sources. The reporter down in Hampshire heard stories of recovery first hand, and took account of the complexities of drug treatment in her reports. What a shock then, when I had a look at the Five Live website later on in the day. Apart from a few valiant souls giving a perspective from the drugs field, the many comments represented a poisonous diatribe from members of the public. It was a stark reminder of why headline figures can be so dangerous – ready fodder for distortion. And of course headlines are impossible to retract and repackage to a public that is determined to make every drug user the reason for all society’s ills. The volume of responses from the field to the drug strategy consultation is a reminder of inspiration within the field as well as problems that need to be addressed. We shouldn’t forget that, during the current media feeding frenzy. 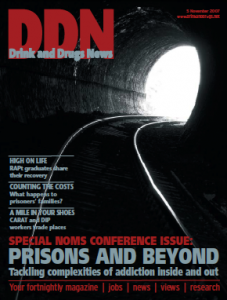 In the centre of this issue we’ve featured the Prisons and Beyond conference, which looked at many different aspects of prison drug treatment. We hope you’ll find it an interesting insight. It seemed appropriate to finish this issue with RAPt’s reunion (page 18) – an enjoyable occasion that brings home the invaluable work of prison drug workers. And finally… we’re three years old this week! A massive thank-you for all your support – and to our advertisers for enabling us to keep a free circulation and vital editorial independence.